Via Teatro Vecchio 5, 30171 Venice - Mestre, Italy. 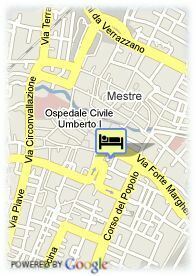 This hotel is located in the centre of the town Mestre and at twelve kilometres far from the Marco Polo airport. The closest bus station is at hundred metres, the train station at one kilometre and a half, and the harbour, at eight kilometres. Inside of its rooms and its usual facilities offer a interior design cared till the minimum detail, inspired from the great masterpieces from the 18th century and that impregnates each one of its corners. 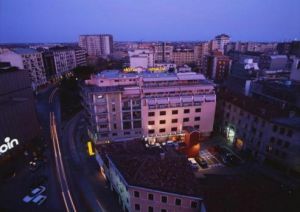 Also stands out its restaurant Giardino Veneziano with specialities based on meat and fish. It also offers five conference rooms appropriate for the business tourists. Free open air parking at the hotel, Busparking. Near trainstation, Centre, Near the historic centre.